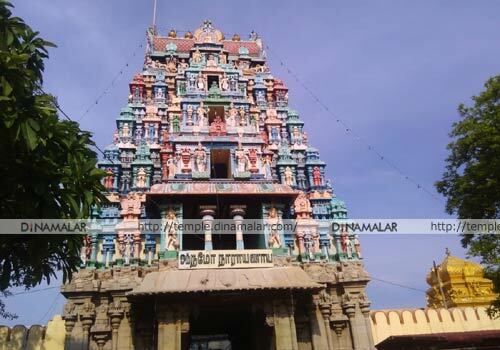 5 day festival in the month of Chithirai (April-May) and 10 day Adi Poornima-July-August are the festivals celebrated in the temple, drawing huge crowd of devotees. The temple is open from 7.00 a.m. to 12.00 a.m. and 4.00 p.m. to 8.00 p.m.
Sri Soundararaja Perumal Temple, Thadikombu, Dindigul district. The sculptures in the corridor-prakara are noted for their exquisite beauty and minute workmanship in nails, muscles and reflecting even the inner veins. Those who have lost their possessions, and those desirous of restoring broken relationships offer lime fruit garlands to Karthaveeriarjuna lighting ghee lamps. Sri Andal graces on every Thursday in the Mandap here, when devotees perform turmeric abishek for early wedlocks. People believe that they get even foreign suitors if so prayed for. Devotees also throng the temple for child boon, academic achievements, business development etc. Devotees perform abishek to the Lord with Tulsi garlands and sari to Mother. 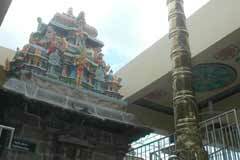 Those having prayer commitments to Madurai Azhagar can offer the same in this temple. Those weak in education, suffering from lack of memory pray to Lord Hayagriva and Mother Saraswathi gracing from their shrines in the Prakara. On Tiruvonam star day, they perform special pujas to Lord Hayagriva with honey, coconut and a nivedhana made of jaggery powder and ghee and cardamom garlands. 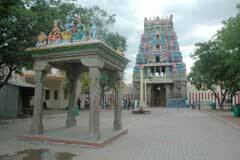 There is a separate shrine for Lord Dhanvanthari. On new moon days, abishek is performed with oil and herbal paste known as Lehiyam. Chakarathalwar graces with deities attributed to Gayatri Mantra. 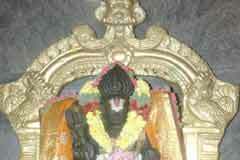 Lord Narasimha graces with Ashtalakshmis. There are also shrines for Vishwaksenar, Twin Vinayaka, 10 incarnation forms of Lord Vishnu, Lakshmi Narasimha, Venugopala, Anjaneya and Swarna Bhairava. 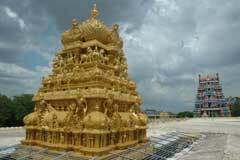 The temple may well be called a treasure house of Indian sculptures of rare workmanship. They speak volumes. Mother Soundaravalli graces from a separate shrine. Lord Vinayaka and Vishnu Durga and deities of prosperity – Sanganidhi and Padmanidhi graces at Her shrine. Mother’s shrine may well be called a museum of sculptures. 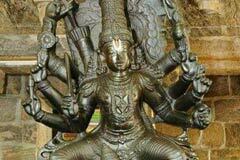 The sculptures include Lord Vishnu measuring the three worlds, Lord Narasimha, Vaikundanathar, Venugopala, Lord Vishnu on Gaurda, Anjaneya carrying Lord Rama on his shoulders, Chakarathalwar, Oordhvathandavar (cosmic dance of Lord Shiva), Oordhvakali, Akora Veerabadra, Rathi and Karthaveeryarjuna. 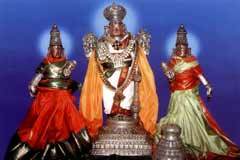 Lord Soundararaja Perumal graces from sanctum sanctorum with His consorts Sridevi and Bhudevi in a standing form. 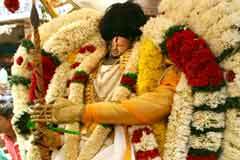 As it is believed that Lord Kallazhagar of Madurai has connections with this place also, a festival of the Lord visiting the Kudaganaru River is celebrated as in Madurai in Vaigai River. The festival represents the grace of the Lord to Sage Mandukya. On each Tiruvonam star day, a dheep is lit at the feet of the Lord. The procession deity would be following the lamp taken before Him. 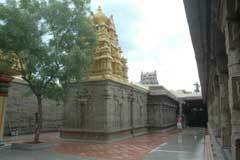 It is believed that those fortunate to have this darshan would be relieved of their sins. Brahmmotsavam is celebrated in the moth of Adi (July-August). The car festival of the Lord takes in place on the full moon day of the month. Sri Akarshana Bhairva offers solution to devotees to manage economic problems. The Sanskrit word Mandookam means frog. A sage was once cursed and became a frog and is known as Sage Mandookya. 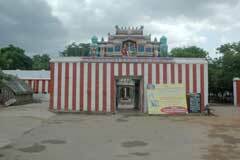 He performed severe penance on Lord Vishnu in this place for relief from the curse. During the course of his penance, a demon was harassing him. Responding to prayer call of the sage, Lord Vishnu-Madurai Kallazhagar destroyed the demon and protected the Rishi. As entreated by the sage, Lord stayed here itself in the name of Soundararajar. The temple, enjoying equal respect and importance as the Kallazhagar temple in Madurai, is believed to have been built 500 years ago by Atchuda Devarayar, a descendant of Krishna Deva Raya. Thadikombu is 9 km from Dindigul on the Vedasendur road. Bus facilities are available.